I’ve been showing you pictures of our red currants and red gooseberries for awhile now, and the time has come to figure out what to do with them. Since both of these fruits are more common in Europe, it took awhile to find recipes that would work. 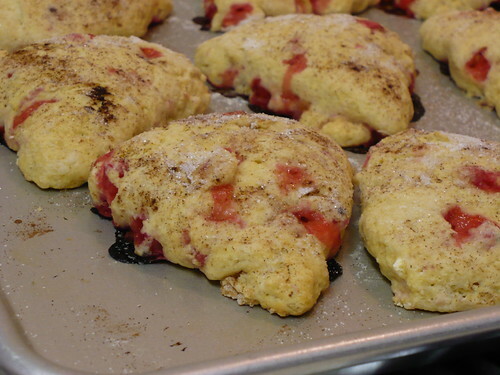 I actually gave up on the red currants, and adapted a recipe that calls for raspberries, because I couldn’t find any good recipes calling for fresh red currants! First, let’s talk about the Fool. 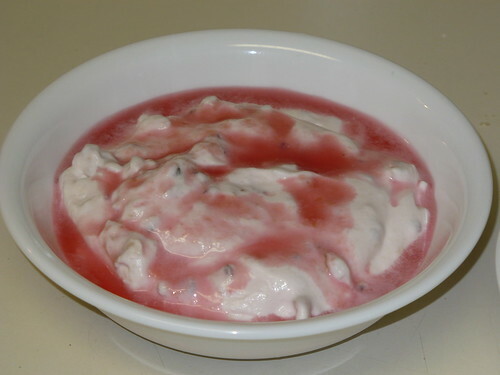 A fool is a dessert that basically consists of a fruit puree that is folded into whipped cream with enough sugar to make it tasty. It is simple, but a bit of a step up from the mere “berries with sugar and cream” option. Here is my 8 oz. of gooseberries, with the stems and tails still on. The stems come off pretty easily (usually during picking), and the “tails” scrape off with a knife. Into the pot they go! I maybe added a bit too much water, which resulted in runny juice later on. I strained and mashed them after cooking. 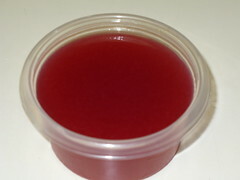 The “glop” looks rather unappetizing, but the juice is a glorious crimson color! I mixed all of the glop and about 1/3 of the juice (since it was runny) into the whipped cream to make the fool. Oh yeah, and sugar. Don’t forget the sugar! Yum! The finished Gooseberry Fool. I garnished it on top with some of the extra gooseberry juice. I could probably even thicken it a bit to make more of a sauce. 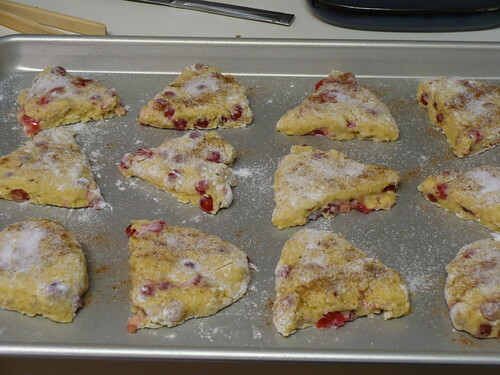 The scone batter is pretty simple to make. The key to good scones, from what I understand, is to make sure your butter is cold and then cut it into the dry ingredients with a fork or pastry blender. 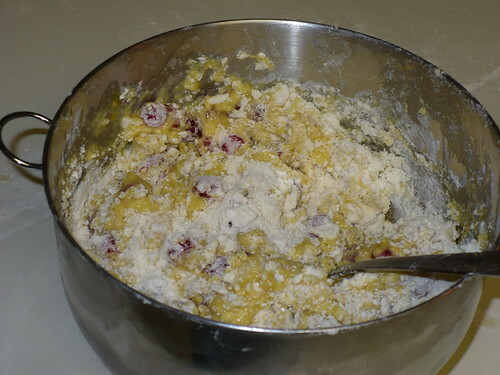 After that step, I gently mixed in the currants, followed by the whisked eggs and milk. The batter was really soft and a little sticky, which made shaping it into rounds a challenge. I made 2 rounds and cut them into 6 wedges each, then sprinkled them with cinnamon & sugar. 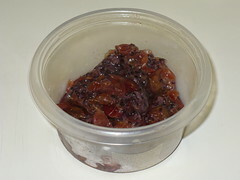 Posted on June 14, 2010, in Harvesting & Eating and tagged berries, cooking, fruit. Bookmark the permalink. 2 Comments. 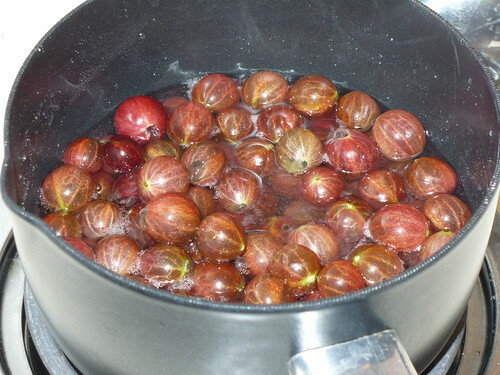 Gooseberries make my favorite pie, but I’ve never had one made with ripe berries. 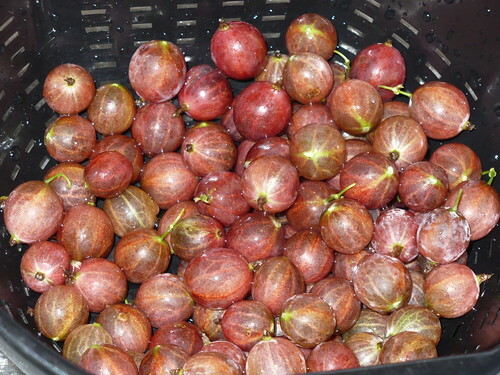 I looooove the tartness of the green gooseberries; when they’re fully ripe are they still tart? In any case, you should definitely make a pie! Yes, the ripe berries are still tart, just not quite as tart. I’m not sure we’re going to get enough all at the same time to make a pie from this single bush.